Around mid-April, while staying in Antigua for the second time (Antigua Part II) we decided we would not make our trip to the Mediterranean as planned. This was due to the unsettled political climate in the midst of the Iraq War. The trip across the Atlantic is too big and challenging to make in such unpredictable conditions - especially with children. 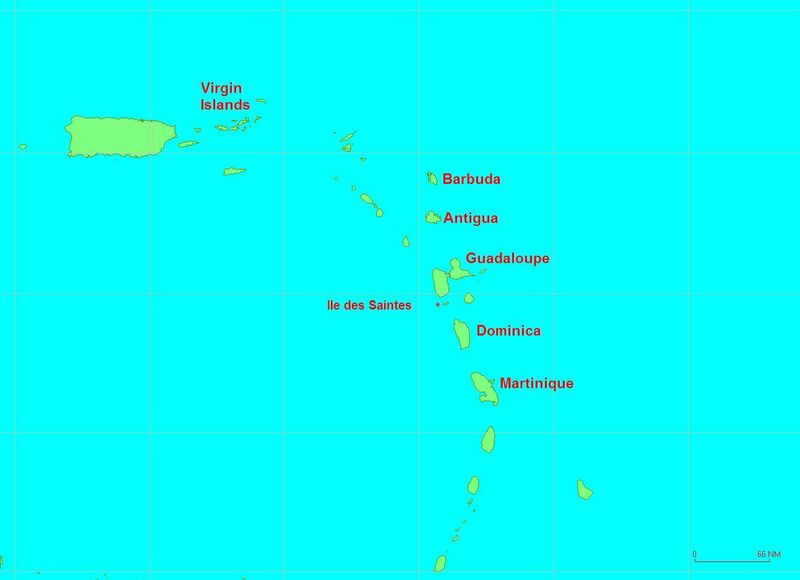 So, we decided to stay in the Caribbean until the hurricane season starts - officially July 1. We decided we would enjoy traveling part of the time with our friends on Hotel California. Hotel California was waiting for their new mast to arrive from the US. But, it didn't arrive the week of the 15th as expected. Instead, it finally arrived during the week of the 22nd. We knew how difficult the waiting was for Hotel California (HC), so we tried to make it at least more enjoyable by doing several activities with their family, and by helping prepare their boat. Fortunately, Jolly Harbour is a nice place to stay - they have a nice hotel, golf course, pool, marina, boat yard, casino (if you do that kind of thing), restaurants, beaches, and a variety of shops. Here are some things we did in Antigua while we waited. 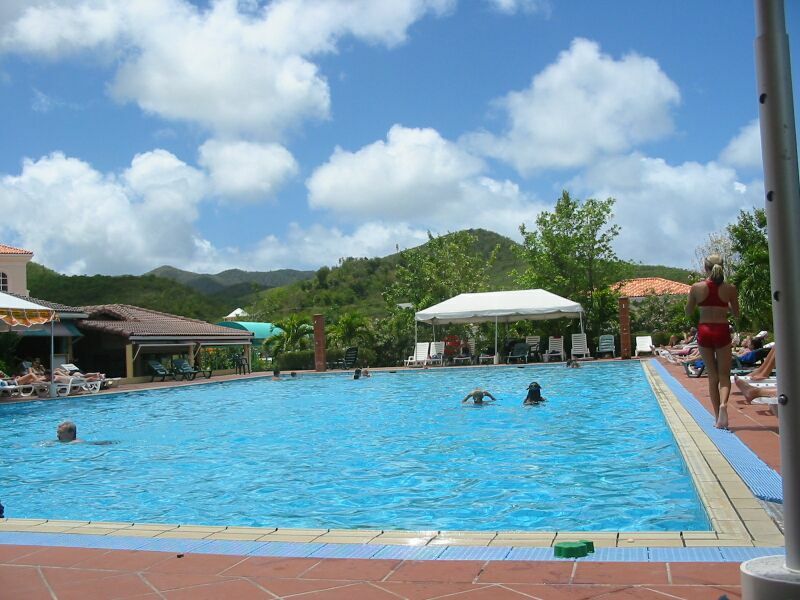 There is a nice pool in Jolly Harbour which is part of the hotel and marina complex. On most days, the girls wanted to go to the pool. It sits next to a sports bar, which also has foosball tables and darts. There were often kids there, and occasionally the kids would play with kids who were just staying at the hotel. We spent many a late afternoon at the pool with HC's family. A nice way to end the day. Even nicer, was that when we were moored with the marina moorings, we could use their showers with unlimited hot water! 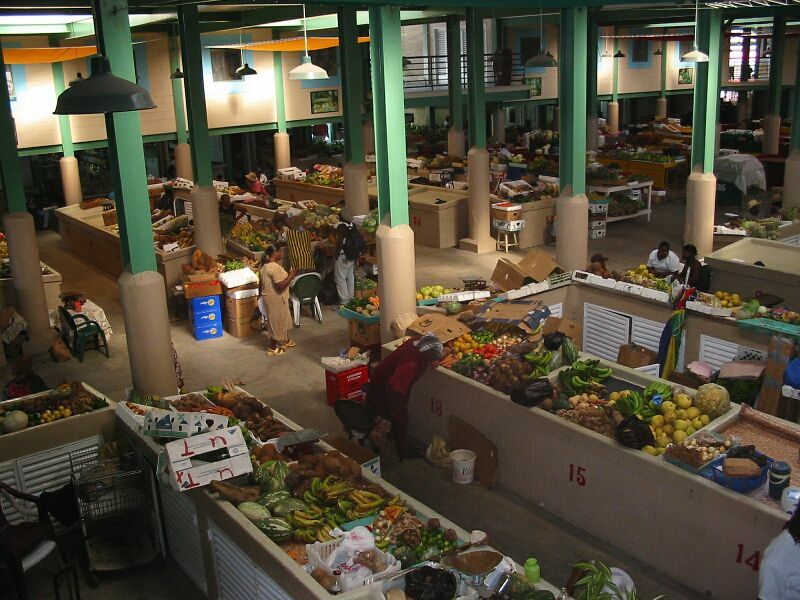 Another favorite activity (at least for the females in the family) was to go to St. Johns (the big "city") to shop. 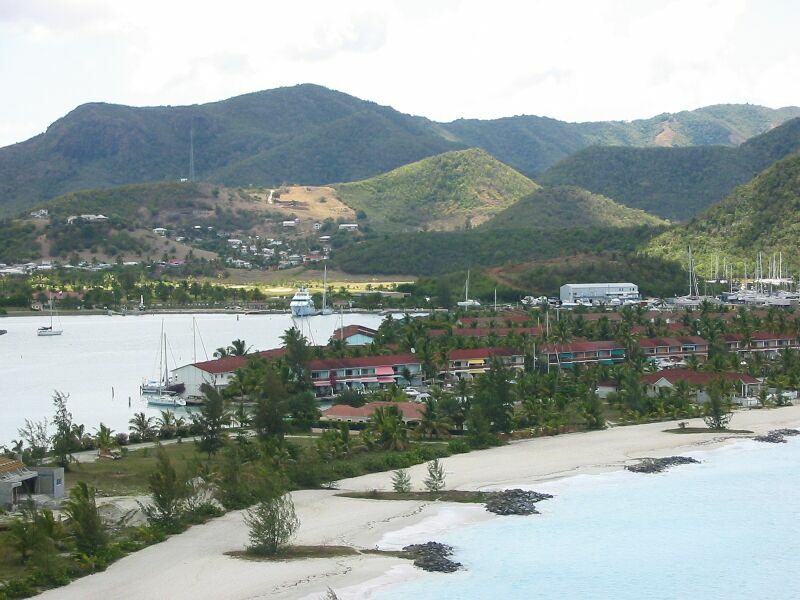 St. Johns is where the cruise ships come to visit Antigua. We normally took the bus, although occasionally HC took some of us in their rental car. The bus ride only cost $10 EC for all four of us (about $4 US). Occasionally Frank would bring his laptop and use the nice Internet Cafe here. Also, one day he had to take care of our Income Taxes in time for April 15th. Fortunately, all that was required was getting an E-mail with signature forms and then taking the signed forms to a Fedex place to have them sent back. There is a nice bookstore in town, and we made several trips there to buy books. Karen shopped for clothes for the girls one day. And she made a couple of trips downtown for groceries. On a couple of days during our 3 weeks there, the guys got to go off and do some things. 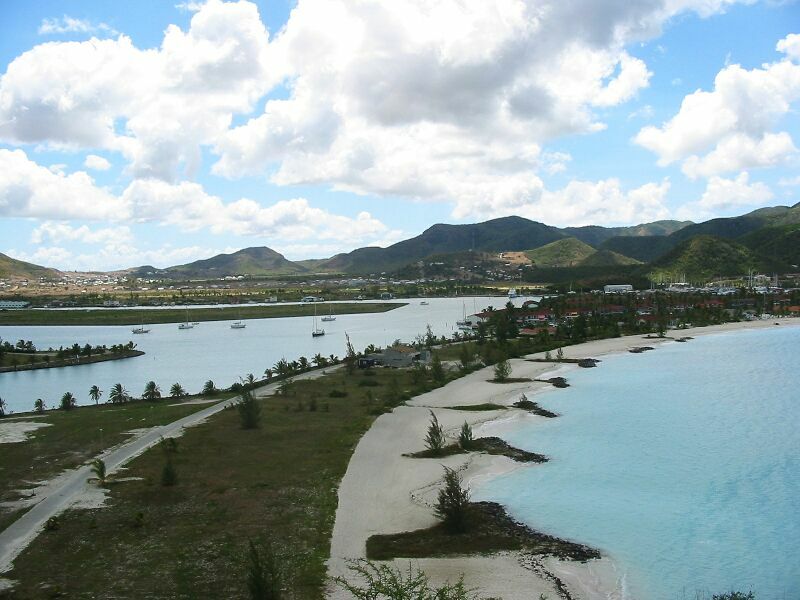 Once, Wilson, Collin and Frank got to go and play 9 holes of golf at the Jolly Harbour golf course. Since none of us had played much lately, we didn't play well, but it was a beautiful setting! 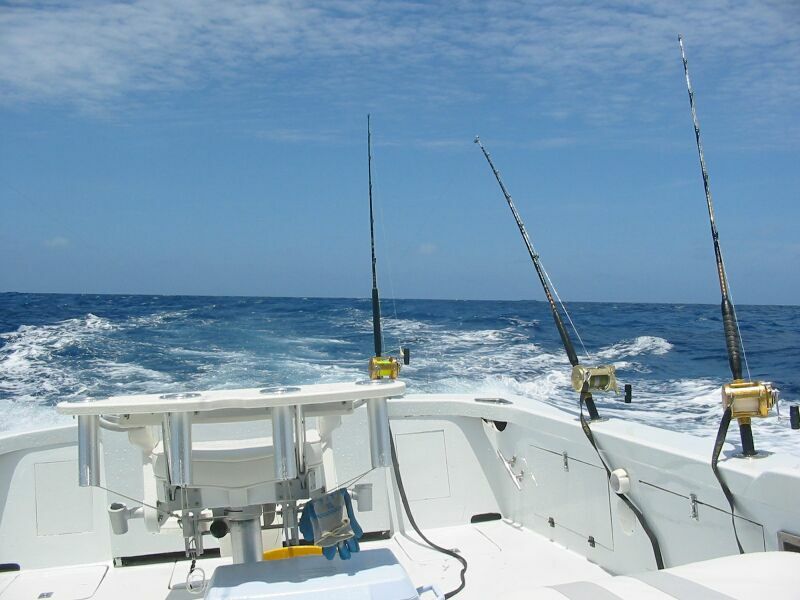 Frank arranged for us to go on a deep sea fishing trip so we could learn more about fishing in the deep blue seas. It was a bit expensive, but Collin, Wilson and Frank learned a great deal. 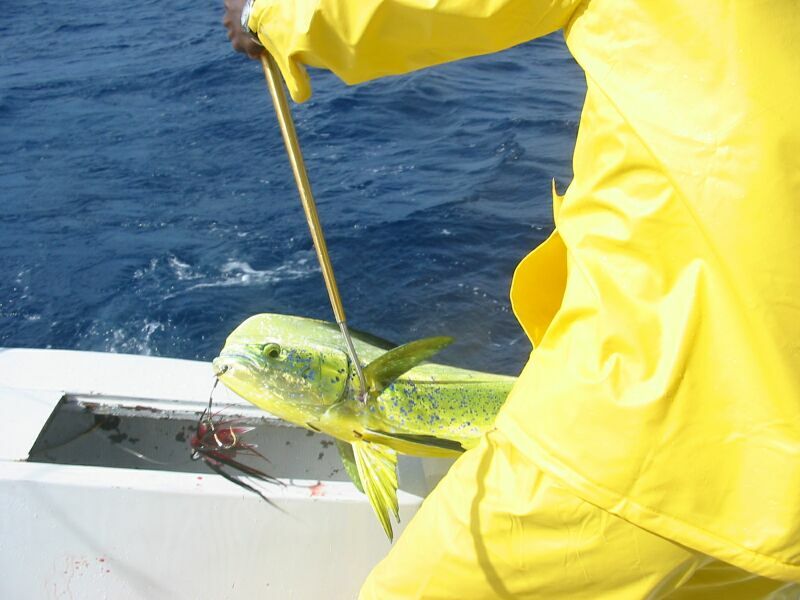 The fishing boat we took out had a very knowledgeable captain, and fortunately was very willing to answer questions that would help out other seamen. 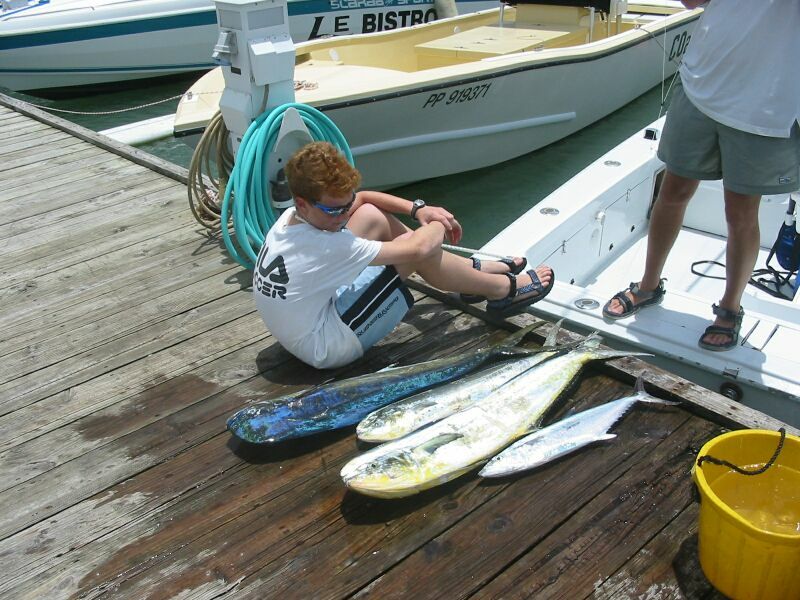 Not only did we learn a lot, but we had a nice catch of Mahi Mahi and a nice sized Spanish Mackerel. One day we decided to take the two families to a miniature golf place north of St. Johns. We took a bus into St. John while HC drove their family up to the golf place, then Wilson drove to St. John and picked us up to join them. This was a less expensive way than taking a taxi. We had a very enjoyable late afternoon playing games and miniature golf, then we walked/rode a short distance to a nice beachfront restaurant. 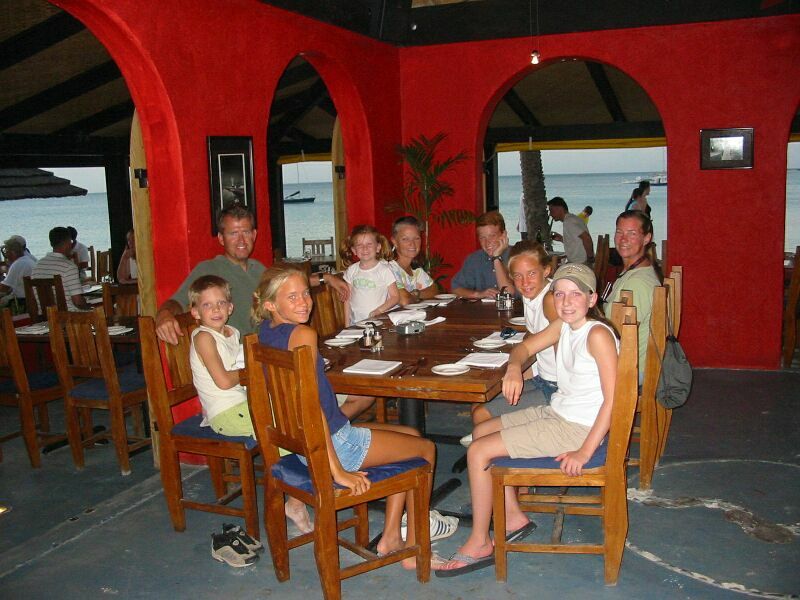 We had a great time having dinner and watching the kids play in the sand on the beach. Afterwards, we took a taxi back to Jolly Harbour. 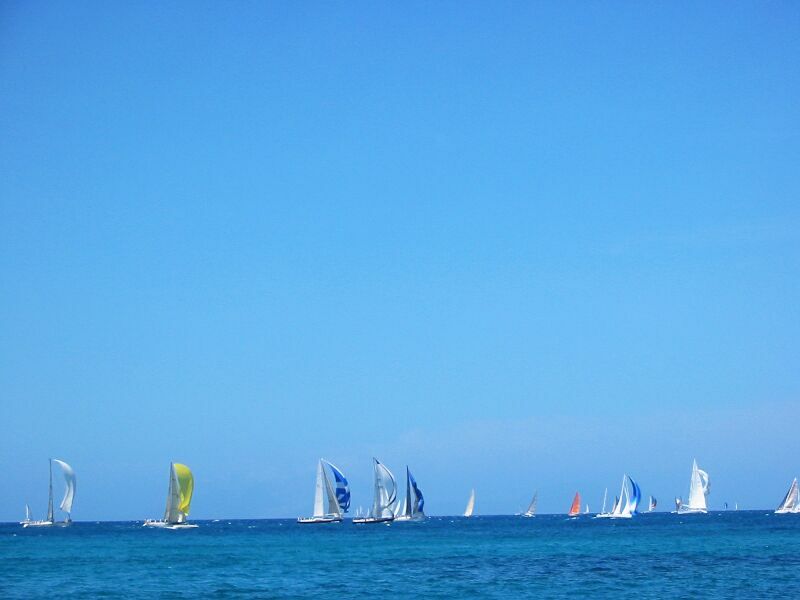 Antigua is the home to some very large and famous yacht races in April. First is the Antigua Classic Yacht Race where very large, beautiful, new and old classic yachts come to show off their boats. Unfortunately, we weren't mobile enough to see the actual races, but we did go to the harbour and walk along the docks to see the boats. Unfortunately it was at night when we went, so we didn't take any pictures. But, you have to see these boats in person to believe how beautiful and luxurious they are. Some of the boats are so big that their annual maintenance probably costs twice as much as PatiCat! Wilson and his wife Elizabeth took Karen and Frank to see the boats, and afterwards we went to a nice restaurant in English Harbour called Abracadabra (a famous restaurant with Yachties). We had great italian food there. 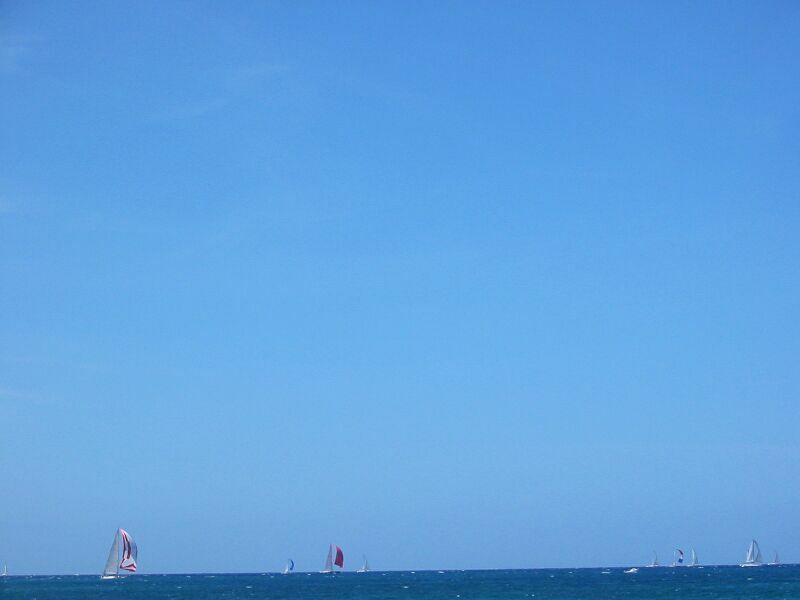 And watched videos of the yacht race on their big screen from our table. 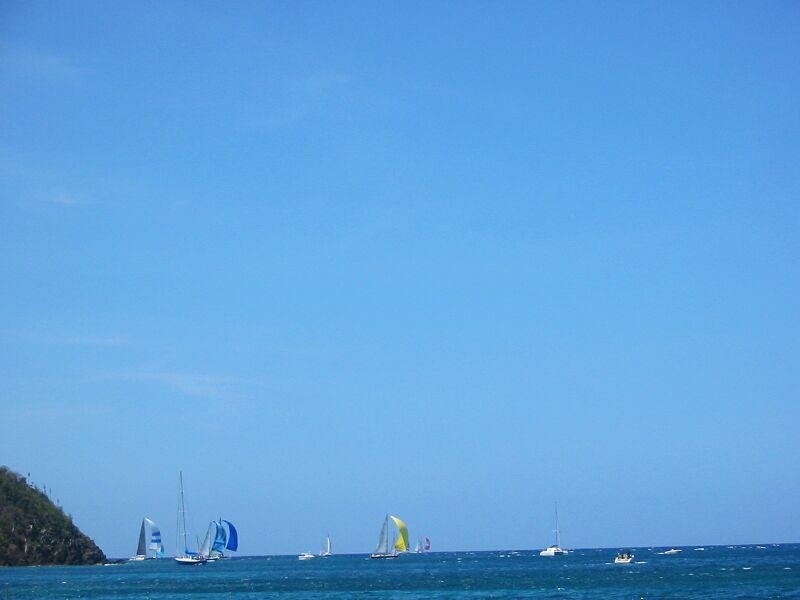 One day, we wanted to get out of Jolly Harbour with PatiCat for some sailing and to anchor somewhere different. So, we took her up to a place called Deep Bay. Frank snorkeled on a wreck near the entrance of the bay which still has peices of its mast showing above the water. It was a large tar ship which sank in 1905 after catching fire. The bay is small, very beautiful, surrounded by cliffs, and has a large resort hotel located just off the nice white-sand beach. Lots of people come in just to stop and go to the beach. But, there's room for at least 15 sailboats to anchor without getting too crowded. We stayed there twice, never with more than 7 or 8 boats. 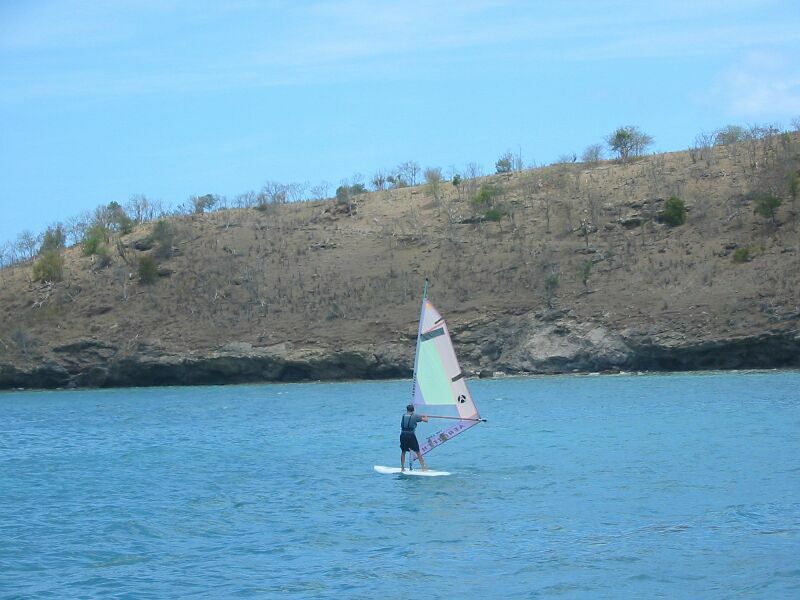 After our first night there, Frank went ashore the next day to rent a wind surfboard to try out some windsurfing (after teaching his home schooling subjects to the girls). The board had some maintenance problems which didn't make his inexperience any easier. But, he managed to sail around the bay a few times. But, not without many, many falls into the water. While he was in the water, guess who showed up? The HC family! They had plans with their church that day, so we had decided to go to Deep Bay. What we didn't know was that their church was doing a beach BBQ at Deep Bay! They were as surprised as we were to see us, since we hadn't told them our plans. Since we had a lot of time on our hands, we got a fair amount of school work done. Frank also did some boat maintenance. 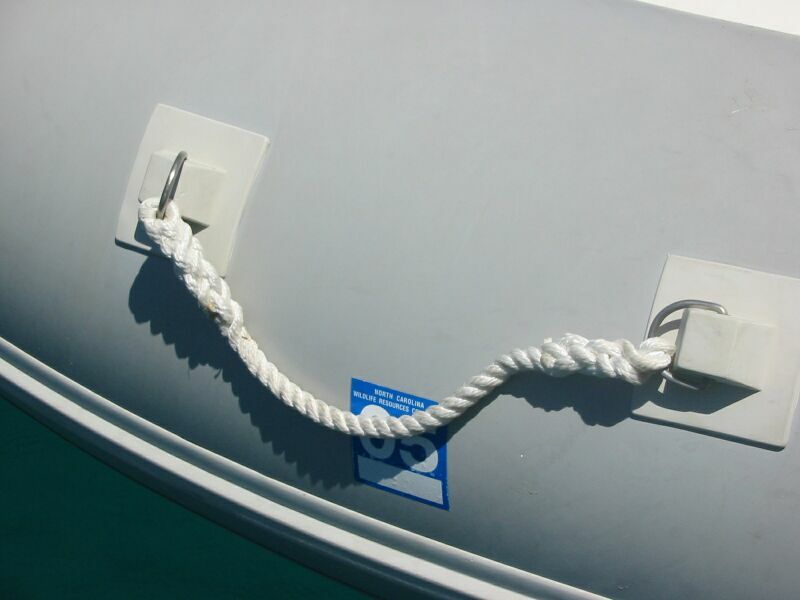 He finally spliced new rope handles on the dinghy (the old ones corroded in the sun and were in various stages of uselessness). This seemed a daunting task, but it actually wasn't too bad. The splicing process does make your fingers hurt a bit though, so he spread the process out over a few days. Frank also did basic maintenance on the engines, and spent time washing down the boat, shining stainless, and checking over things. Frank tried to help Hotel California with their repairs. Most of the work was covered by insurance, so Wilson didn't have to do much except supervise. However, as their anxiousness to leave increased, Frank helped as much as he could to help speed the process by assisting the men doing the work. He was also there when they put the boat back in the water, and when they put the rigging back on the boat. There were many agonizing moments with the final work - especially for Wilson - but, after only an extra couple of days HC was finally ready to sail. Antigua Race week was about to start the next day - a Sunday - and we were told a good place to watch the race. 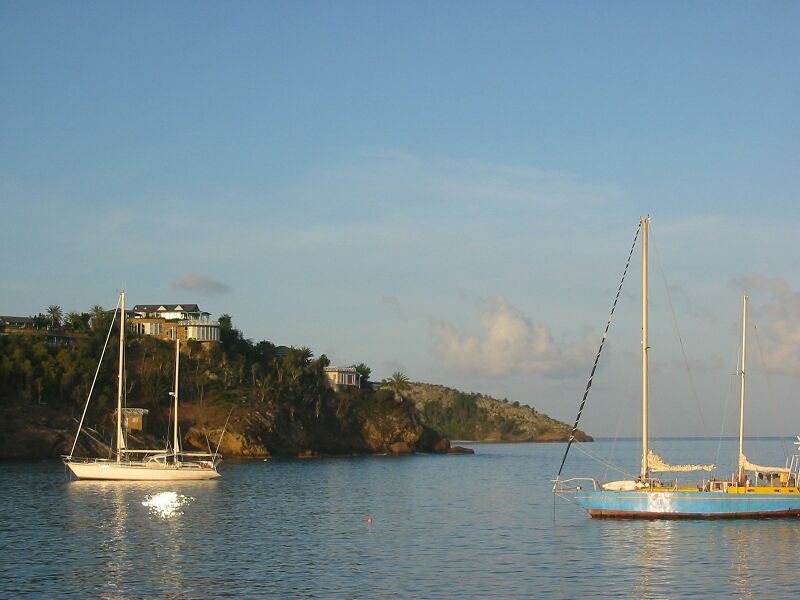 So, we sailed both our boats down to the SW side of the island to Carlisle Bay. We ended up arriving early in the evening on Saturday. The anchorage was a bit swelly, but I don't think HC even noticed. They were too happy to finally be back on the water and out of Jolly Harbour! Antigua Race Week is the culmination of the big events here (the Classic Race, also a Mega Yacht Race - where the biggest richest yachts in the world come to do a race and show off their stuff). 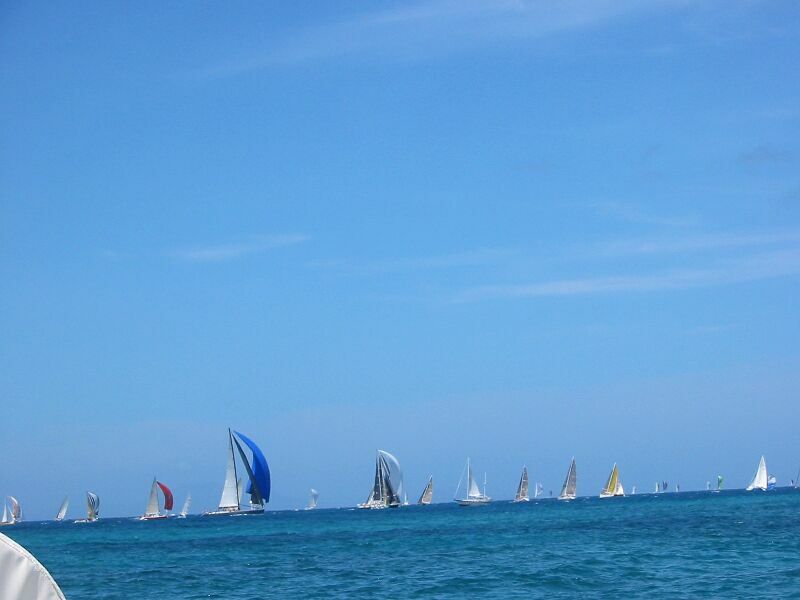 Over 200 boats participated in this years event. We were told to be in Carlisle Bay on the morning of the first day and the boats would round the point with their spinnakers and then round a marker visible just outside the bay. HC and PatiCat had ringside seats to these events and we captured it as best we could with cameras and video cameras. However, even with our great location, we were still a mile or so away. So, don't expect close-up action. 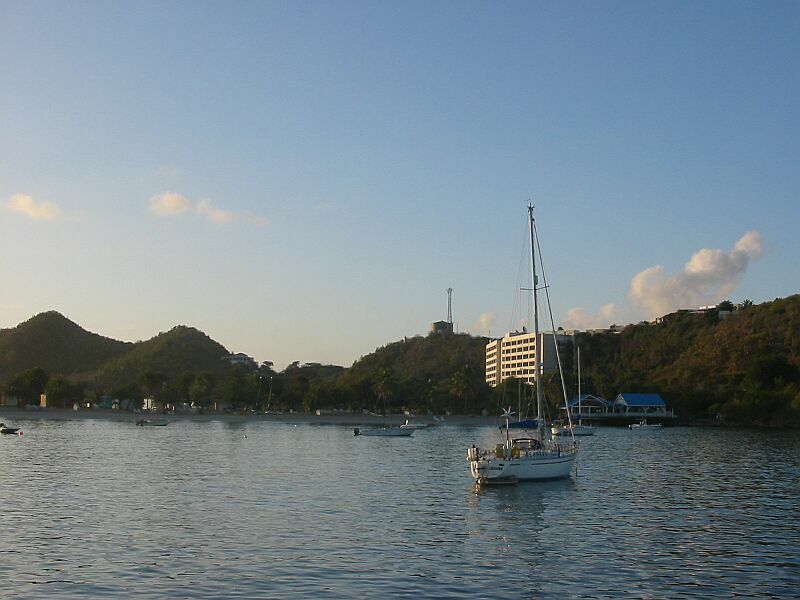 The next day, after the trip to Carlisle Bay, HC and PatiCat sailed back towards Jolly Harbour. 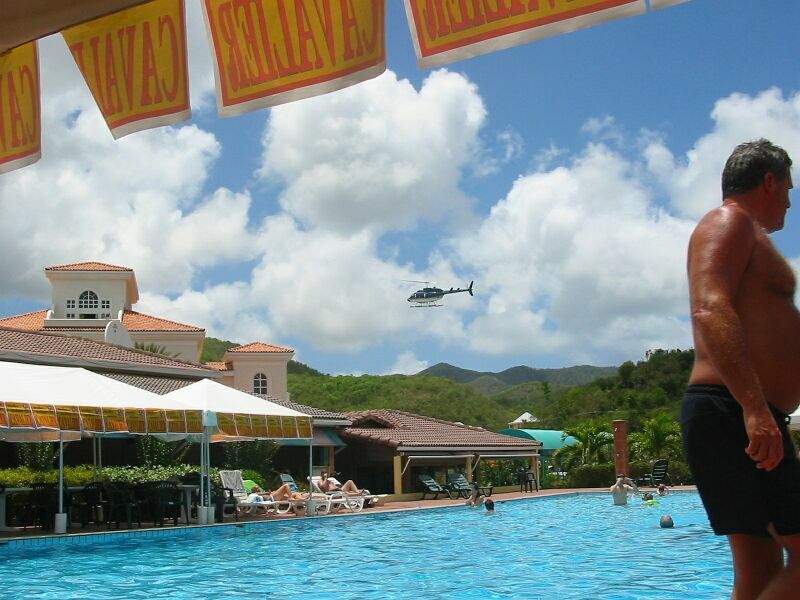 HC needed to do a final inspection with their insurance agent, and PatiCat did a final prep for leaving Antigua. We stayed Sunday night at Deep Bay and went into Jolly Harbour early the next morning. PatiCat cleared customs and got some fuel and water. Then PatiCat left for Guadaloupe. HC would join us the next day, and we hoped to show them a bit of this island during their brief stay.